“You are riding to Ohio? On a bicycle?” My dentist was almost speechless. Reversing the typical pattern was fun. We all know what it’s like trying to answer questions while in the reclining chair. The plan was simple. Meet my friend Kurt, pack up a tent, a sleeping bag, a change of clothes, an extra inner tube and ride. He was riding to Minnesota, so I’d join him for the first part. It was roughly 700 miles from New England to my son’s house in Cleveland Heights, Ohio. I’d done this kind of thing before, but I was sixteen for that ride across the Canadian Rockies. Now, at 57, and off a bicycle for 25 years, this was going to be different. But, I was up for the challenge. I spent a year training, both at the gym, as well as on the roads of my home state in Rhode Island. I didn’t know it at the time, but these would be the early steps of my introduction to minimalism. For ten days, we road roughly 70 miles per day, most of it along the Erie Canal Bike Path until it dropped us at the edge of Niagara Falls, where we picked up the roads heading west. We camped almost every night, except for a hotel stay during a severe thunder and lightning storm. The days and nights developed into a rhythm that consisted of the basics – riding, eating, and sleeping. And there was a freedom to the simplicity. I found there was no time to think about work, no desire to check my Twitter feed, no distractions from the simple push on the pedals. Six months later I stumbled onto the word, the movement, a book and then a movie. Minimalism. Motivated to rediscover what is life when we strip all the crap out of it, my wife and I are on a journey toward simplicity. As summer rolls around, I’m outside more on my bike. The simplicity of the machine motivates me. There are two wheels, hung on a frame, connected by a chain, and powered by me. 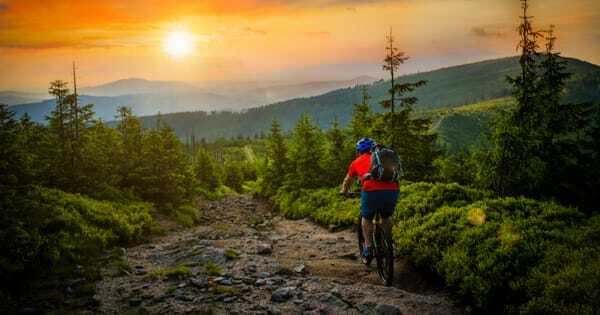 Rides are not exercising routines, though they are that, they are moving meditations. There is the rhythm of the breathing, the consistent cadence of rotations, even the interruptions of gears shifting and clanging – again the freedom of simplicity. Like many in our consumer-driven culture, I live in the wilderness of temptation constantly. The acquisition bug is my constant companion. It even infects my two-wheeled vehicle of simplicity. Magazines and websites to consider another purchase – a new helmet, a new jersey, a new bike, lure me. I succumb from time to time, but what is different now is an enjoyment of the wrestling match. In the past, I would buy it. Think about how to pay for it later. Now, the questions of need versus want, thrill versus value, instant gratification versus long term goals. I look at things differently now. The internal dialogue is rooted in something more profound, namely a desire to be focused, attentive and grounded. Oh, I’m no monk, no stoic guru. I’ve got my epicurean indulgences, which focus around fruits and vegetables, an excellent grilled salmon and a glass of Chardonnay. But, cooking and meal preparation is replacing the nearby Oyster Bar. And yes, I’m still a lover of books, but our state library system is a delight and quite the budget help. Then there is an afternoon espresso, this cyclist’s main raison d’etre. These indulgences now have more value, rather than mindless activities of consumption. At a younger more idealistic age, I held a philosophy of living on less for the good of the planet, but that’s all it was – a philosophy. Now, for the first time in my adult life, I’m finally finding an integration of my values and my lifestyle. As I move along this journey of minimalism, it is the beginning of syncing up the ideal and the real that is most satisfying. I’m finally starting to be the person I’ve always wanted to be, someone with integrity. It’s this discovery that provides the greatest reward, and the bicycle is the tool to get me there. The post Bicycling Toward Minimalism appeared first on The Good Men Project.